Weiss Lake is known for its excellent crappie population; in fact, it's often referred to as ''the crappie capital of the world.'' Weiss Lake is not limited to crappie alone, and largemouth striped and hybrid striped bass add to the lake's diversity which attracts numerous tournaments on both the local and national level. Weiss Lake is called the Crappie Capital of the World. Nestled on the Coosa River in Cherokee County on the Alabama - Georgia border is Weiss Lake. This 30,000 acre impoundment is definitely one of the hottest crappie fishing destinations in the United States. Weiss is a shallow, stumpy lake but that is just what makes a happy crappie. Right now you can try fishing the creek channel edges and slopes for some nice slabs. Tight-line a minnow on the bottom along these ledges, preferably along submerged cover, and remember to fish slow. If you're trolling, try weaving back and forth over the channels and you're sure to find some fish. 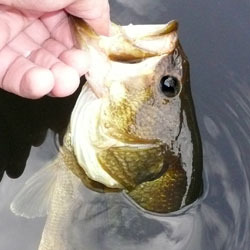 Tube jigs seem to work better for me when fish are more sluggish in the cold water. Less movement is the key here, save the curly tails for the pre-spawn. You also might want to try a double-rig. Tie 2 jigs on your line, or 1 jig and 1 minnow. If the fish prefer the minnows, double up on them. 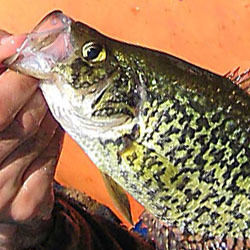 As the temperature warms the crappie will start to move closer to spawning areas. Troll with crappie jigs across flats adjacent to spawning coves. Remember though, with all of the stumps around, you WILL get hung up eventually, and that's why I like using 4 lb. test line. It's easier to break when snagged, and you don't have to worry about losing a rod and reel. Try the Chattooga River, the Little River and Yellow Creek areas for trolling. I prefer a black/blue and chartreuse curly tail jig in this situation. Don't forget that on Weiss each person is limited to three rods a piece. When the dogwoods start to bloom move up into the coves and fish small jigs or minnows around shallow cover. This is the time when I'll fish jigs with a bobber, I can keep the jig where I want it in the shallow water longer. You should have no problem catching your limit, which is 30 fish per day on Weiss Lake, and all must be at least 10 inches. This is also the best time for night fishing, and you will find yourself getting worn out from catching fish. If you're up to it, you can catch well over 100 papermouths before midnight. by Scott Rogers - Big Fishing Shop. Each detailed map provides depth, contours, structure, boat ramps, and updated fishing information. 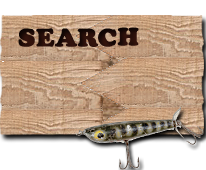 Weiss Lake fishing maps also include lake info such as gamefish abundance, forage base, water clarity, weedline depth, bottom composition, complete latitude/longitude grid lines and dozens of GPS waypoints & coordinates. "The Bass Pro Shops Squirmin Lizards are made softer with slimmer profiles making them ideal for Carolina rigs. Our versatile Squirmin Lizards are great in deep or shallow water, and sport curlyimbs and a proven squirmin tail"
"Smallmouthsove Strike Kings Bitsy Bug Mini Jigs! In additiion to their downsized design, Bitsy Bug Mini Jigs feature premium silicone skirts and fiber weedguards. Downsized design Premium silicone skirts Fiber weedguards"
"Old Mr. Toothy isnt about to swim off with this lure dangling from his jaw! Our Bass Pro Shops Muskie Angler Closed-Loop Spinnerbait features a fully closed eye loop attachment, so you can run it behind a steel or titanium leader." All material in these documents are copyright © 2000-2017 www.TheFishinGuide.com.